Over the last six years The Mars Volta have become one of the leading lights of modern progressive rock, tacking their influences from many of the classic bands, as well as a few very none prog bands whilst sounding completely unique. This, their fourth album, is quite simply the bands crowning achievement, the first time they have been able to top the performance on the debut album, De-Loused in the Comatorium. Gone are the long epics like Miranda that Ghost Just Isn't Holy Anymore and Tetragramation, to be replaced with shorter, more concise, songs that still have enough time to develop, and then shift, musical themes. This album hits hard with fiery energy from the start of Aberinkula and forces the listener to hold on for dear life for its entire length, not that it ever gives you any reason to consider letting go. A fast paced and high energy album, the only real slow downs are the tortured Tourniquet Man and the almost relaxing Soothsayer. This is the first album of theirs that I can honestly say has no weak parts to it, everything is focused to squeeze everything out of the ideas on display without ever lingering long enough to divulge into needles noodling, the band has clearly taken that step back to the edge that they had moved from in Amputechture. Another positive from the condensing of songs is that they no longer have this disjointed jump in dynamic and style mid way through a song, something that marred the longer songs on Amputechture. 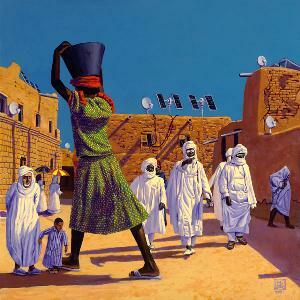 The Bedlam in Goliath isn't just The Mars Volta's best album to date, its one of the most accomplished albums in my collection.